This site represents a new idea your "one-stop" for hiring Louisiana graduates. Graduation day is a milestone in a person's life. Whether it be achieving a certification, associate degree, four-year degree or MBA, an individual has set themselves apart and proven they were willing to take that extra step and prepare for opportunity. They are ready to work! As a business person, you know the importance of having good talent to grow, compete and prosper. Our universities, colleges and technical schools have produced qualified graduates, but it can prove to be a challenge to connect the right candidate with the right employer. How easy is it for a Louisiana Tech graduate to know about an opening at a new start-up business in New Orleans or for a Southern grad to become aware of an opportunity with a Shreveport technology company? It could be the perfect fit�but being unaware of each other, the grad might choose to leave Louisiana or the company might resort to a national online service and hire someone from out-of-state. Louisiana Graduates.com is here to change that. 1) We want to be proactive by marketing our graduates to you in order to help them get a job and keep this talent in Louisiana for our future. We are proud of their accomplishment; 2) We want to help you find the talent, skill, experience and training you are looking for in your next hire�and we want to make it easy for that to be a Louisiana grad; and finally, 3) we want you to be aware of the quality of our graduates and the resources available year-round to help you find the right employee for your company or business. 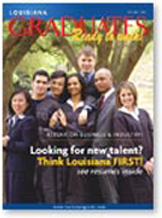 Through the one-stop search form on this site, you can access thousands of qualified graduates from the four-year universities, community colleges or technical college campuses that participate in Louisiana Graduates, a new publication dedicated to bringing the quality of Louisiana graduates to the attention of Louisiana employers. In as little as 48 hours, you could receive resumes on candidates selected to fit your unique search. Send as many job requests as you like. It's free! Also, take a moment to check out the items in the menu bar including "message from Governor, " "facts on higher ed," and links directly to school web sites. We are excited about this new Web site: www.LouisianaGrads.com. We want to thank you for visiting, and for your consideration of all Louisiana graduates. We hope this site proves to be a valuable resource for your company as you hire employees in the future. (Bookmark it now and forward the address on to others.) Let us hear about your experiences with this site and any ideas or suggestions for the future. E-mail me at [email protected] or call 225-928-1700. When it comes to hiring graduates CHOOSE LOUISIANA. It's great for business! Copyright �2003 by Louisiana Business Inc. All rights reserved by LBI.